Nature programmed dogs to eat whenever they could. In the wild, a dog that refuses food is a very rare beast. In the wild, dogs don't know where their next meal is coming from so they take every opportunity to eat. But domestication has created a few blips in the dog's feeding mentality. If you're dog is a fussy eater, something has gone wrong. Your dog is actually fighting against thousands of years of survival instinct by picking at his food. You need to find out why. 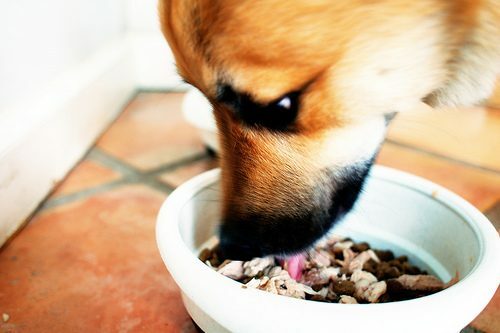 We discover just how easy it is for owners to unwittingly put their dogs off food. We reveal how your dog's strange eating habits conceal are more serious problem. We explain just how unnatural is for a dog to be fussy. We find out three simple ways of getting your dog back on his food. When a pet dog refuses to eat, the problem is either physical or psychological. When a pet dog refuses to eat, his owner pleads with him and tries to tempt him with food fed by hand. If the dog is sufficiently neglected and bored he may try this to get attention. An intelligent owner will counter this common canine play by giving his dog companionship, exercise and stimulation. I was wondering if you could give me some advice. I have 3 dogs. Mickey, whippet-is a fussy eater he doesnt like dry food but only wants tinned food, i have tried leaving it down all day i have tried only putting it down fot 10 mins, this is the only thing he is fussy about he will happyly eat anything else at all. He is a year and a half old. The other probelm he has is toliet training. He will happly do it anywhere on our walks (concret, grass, pebbles, plants) but he will not do it in my garden. My garden is concret and very very small. I tried doggy nappies (which he takes off) and briught a crate, but he does it anyway normally in his bed. My other dog bella is a sheppard cross with hunterhound female rescued her so dont know age. She seems to display dominance by mounting, her body language when meeting other dogs, she also gets jealous if i do anything with someone else and gets talkative about it, she chases the other 2 when off lead that seems slightly agessive. Due to pulling she now wears a head coller lead which does work.